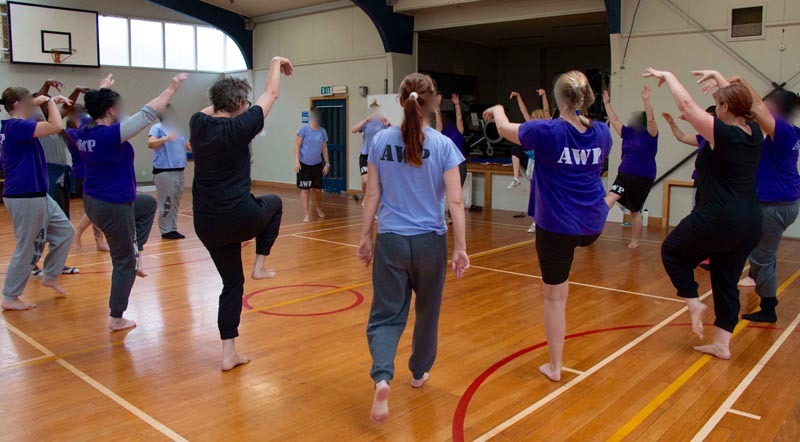 This is my reflection of a performance by a group of 16 women, prisoners at Arohata Prison. 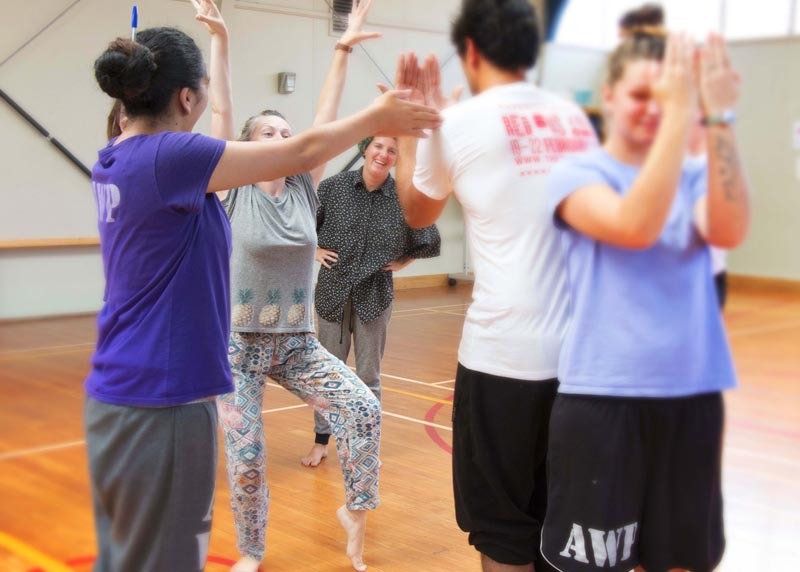 They worked together for a week with German theatre practitioner Uta Plate, and began her workshop with nothing but a space and some people. As well as the women, nine artists – musicians, actors, filmmakers, a visual artist – worked with Uta as a training opportunity. Uta used a theme as a starting point: the book Alice Through The Looking Glass. Here’s what I thought from my looking. From the moment they entered the performance space, the gym, I was spellbound by the women – their voices, gestures, movements and songs; by the soundtrack of prerecordings and live singing, guitar and drum beats. The women came in chanting “Listen I'm inviting you in; I’m inviting you”, building from a whisper to a loud, in-your-face chant. We listened. Over the next 45 minutes, the women presented scenes they had devised; scenes based on slices of their lives, both in prison and beforehand. Scenes based on experiences such as being transferred from the women’s prison in Auckland to Wellington's Arohata. A scene depicting the temptation to go out boozing with your mates versus staying home with your children. A scene representing a thirst for “potions” procured from Alice’s Mad Hatter, knowing full well the potions were no health promoter. A spoken scene where the woman is a swimmer, drawn in by the sea and swimming far out, swimming alone. It’s become the normal thing to do so she swims for years, losing touch with everything else. When she wants to come back to her life, to those she loves, the sea won’t let her go. One woman did a Cook Islands dance, herself singing in accompaniment. At times, though the dance flowed, her voice wavered, as if in effort or emotion. As we hear later, it was the first time she had done anything like this – the first time she'd shown in public her Cook Islands heritage. Afterwards, there was a question and answer session between performers and audience. 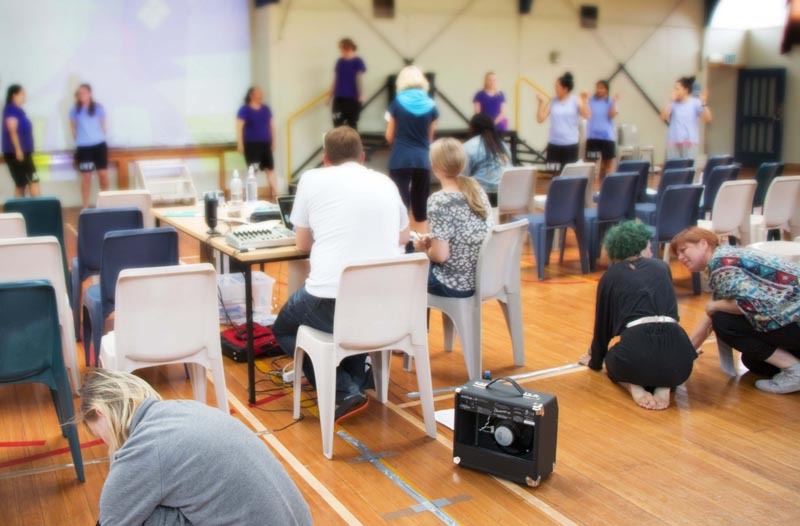 The audience comprised the rest of the prisoners, the artists, prison Corrections staff, and Arts Access Aotearoa and the Goethe-Institut New Zealand staff and guests. Others said they had found confidence in themselves, discovering that they could speak up, that they had a story to tell. Stories that mattered and that others would listen to. Learning their lines was the biggest challenge for some of the women but for all of them, the process had made them bond as a group. Will the experience of workshopping, bonding and performing, reduce the odds of each woman re-offending? I don’t know. It’s said that it’s in risking ourselves – in revealing ourselves to one another – we become ourselves. That’s as good a place to start as any to build a new life. After the Q and A session, I talk to one of the performers who seems familiar to me. It emerges that she feels the same, like we've met before. It's unlikely: we grew up in different towns, there's probably 20 years between us. It’s likely we remind each other of someone we know. She's still familiar; she's the one I think about the most. I wonder when she wakes up what she would say now to her children, if they were with her. Julie Clifton is Volunteer Co-ordinator, Department of Corrections, for Arohata Prison and Rimutaka Prison. Original generation time 1.2625 seconds. Cache Loaded in: 0.0121 seconds.